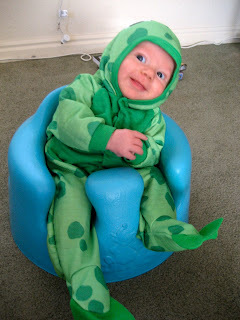 WARNING:LOTS OF CUTE BABY PICTURES AHEAD!! Playing with Grandma Here are our graham cracker creations this year. Reed's is his parent's house-with a cleaned out garage! Way to go Grandpa Chil! Warm in his new Christmas PJs! 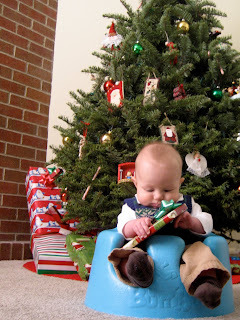 Christmas is so much fun! Christmas is a lot of work! 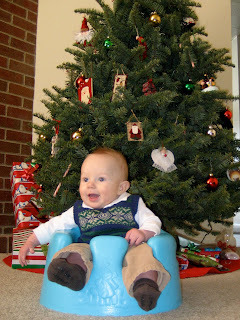 Evan got green beans and peas along with some new bibs and bowls in his stocking! Not so sure about green beans, but loved the peas! 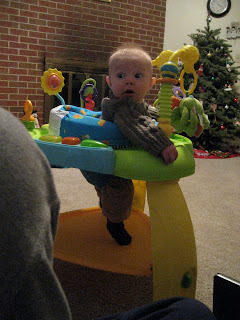 And Evan turned 5 months a few days after Christmas! Getting so big! Let's be honest...this is mostly for the grandmas! But way to go Evan! All that practice finally paid off! Since we were in Vegas the weekend before Thanksgiving, we decided to just keep going and spend the next week with my family in California. The weather was absolutely wonderful-why did I ever leave that place?! We had a really good time and enjoyed being able to spend Thanksgiving with family. We played with Grandma Jo...A LOT! And of course ate a ton of good food! This is how Evan looked most of the time on the 9 hour drive home...such a good boy! 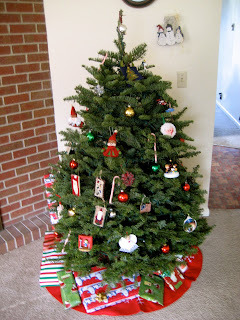 We came home and got this lovely Christmas tree-our house smells sooo good! And Evan turned 4 months! New Favorite Trick: Sticking out his tongue! This weekend the BYU Men's Volleyball team had their first pre season tournament down in Vegas. Since it's not too long of a drive, Evan and I decided to go! We went and stayed with my brother and his little family (thanks guys!). Evan got to meet his cousin Reggie and they had a lot of fun together. Friday night Reed's team played Long Beach State and Grand Canyon University. They won both games and Reed played really well. On Saturday they played Long Beach City College and Long Beach State again. And once again they won both games! It was a lot of fun to see Reed play again and of course it's always fun to win! Evan did really well at the games. He liked to watch for a little while and then he would take nap! We were there for 4 games and he didn't cry once! He must love the gym already! 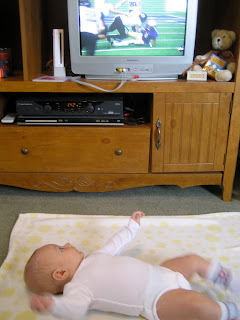 Here are some pictures of Evan with all of his "uncles"
Both love to watch college football (this kid LOVES to watch TV!) 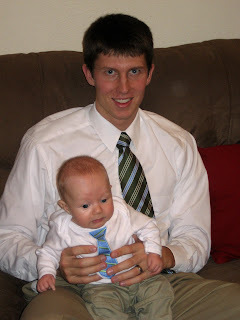 And they both look good in a shirt and tie! Matchy-matchy! And here's Evan after his first BYU parade And spending time with Grandpa Johansson during his surprise visit! Thanks for coming to see us! And we are moving this Saturday. We're excited for Evan to finally have his own room, but are so bummed we're not staying in our ward. We have really loved this ward and tried to find something that would work for us within it, but it just didn't work out. We're so grateful for all of the friends we've made and for all they've done for us, especially when Evan was sick. Thanks guys! We'll still be in Provo, so let's not be strangers! This Friday the volleyball team hiked to Stewart Falls up by Sundance. All the guys were encouraged to bring a date, so Evan and I got to tag along. 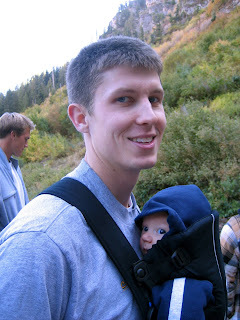 Reed and I had done this hike over the summer when I was about 6 months pregnant, so I told Reed it was his turn to carry the baby. We loaded Evan up in the Baby Bjorn and he did great! 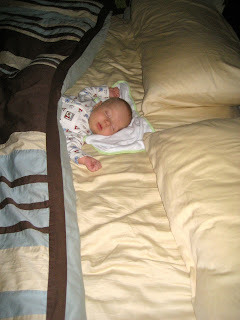 He slept part of the way, but the rest of the time he was very content just looking around, enjoying the fresh air. It was a perfect day to go-it was clear and the fall colors were so bright and beautiful! Thanks for capturing the moment Futi!